Give a critical donation today and keep this Grande Olde Dame going!! Your Donation will keep culture and the arts alive and well in downtown Hilo. Whether you like great independent movies, live music concerts, special events or just love our historic old building, your financial gift will help to sustain the Palace Theater. SUPPORTER GIFT CARD: You can use a Palace Gift Card yourself, or buy one as a present for someone else. When you prepay $50, $100 or $200, we’ll mail you a Palace Gift Card in that denomination. Great gift idea! Use it as cash for films, live Palace Theater concerts, or at the café. Enjoy pre-paid entertainment at the Palace Theater. 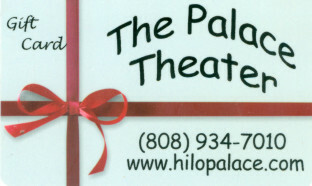 Share your enjoyment of the Palace Theater with others by giving them a Gift Card. GRASSROOTS DONOR: Be a Grassroots Donor by selecting this option. For every $50 donated, you get two free Palace movie passes. Donate $50 to $450 and you can get 2 free movie passes for each $50 you contribute. Your donation is in full compliance with IRS rules and is tax deductible less the $8 value per movie ticket. You are recognized in the newsletter and on our website the month following your gift. Your name will appear in the printed program of our Fall Musical. Help the Palace even more by opting to refuse the gift movie passes and have your entire donation be a tax-deductible gift. SUPERSTAR DONOR: If you provide a gift of $500 or more, you are a Superstar! You are recognized in our newsletter, our website and our printed programs. Your name (or business) will appear for a full year in the display case outside the theater. Your name (or business) will be shown on the on-screen trailer, appearing before all films. If you give $2000 or more, there are free tickets associated with these gifts and their value is within IRS regulations and they need not to be deducted from your receipted gift. -At $10,000 you get 4 preferred seating tickets to the concert of your choice. Yes, I want to donate to the Historic Palace Theater! 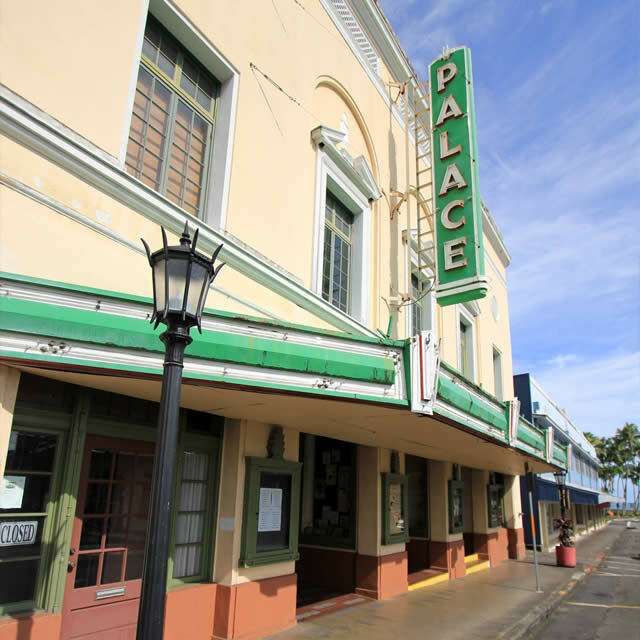 To make a donation to the Palace Theater, please contact us by way of phone at 808-934-7010, email or drop by our beautiful building located in the heart of Downtown Hilo. You may also mail us your cash or check donation to 38 Haili Street in Hilo. Checks should be made payable to “The Friends of the Palace Theater.” Office hours are M-F, 10am-3pm. We are a 501c3 registered non-profit. Check with your tax advisor to see if your donation is tax deductible.